Last month on 29th June I was invited to The Butterfly Project Spa party. 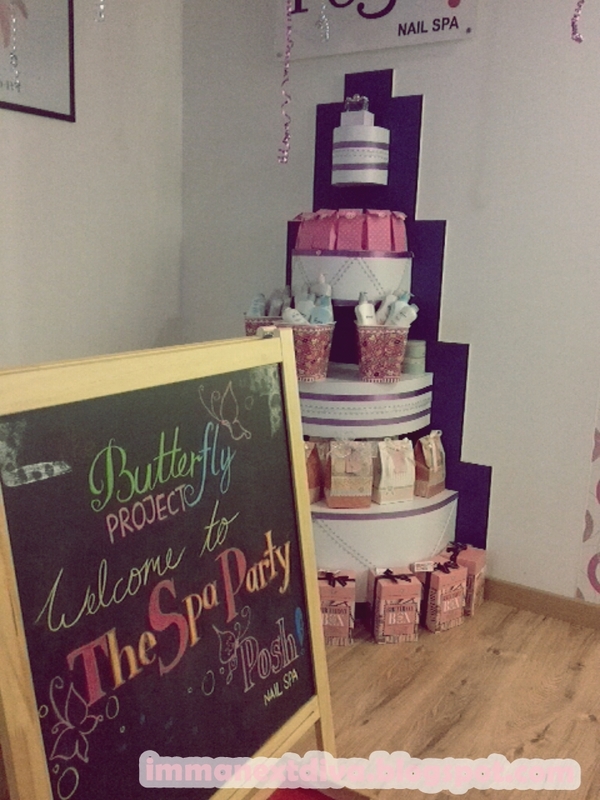 The spa party was successfully held at the Posh Nail Spa.. I never been to any nail spa before, that was my first time. And I was super excited. The funny thing is that, I did not follow the dress code. Yup! I wasn't able to find any bathrobe anywhere near me. Haha. Mummy Tammy 'marah-marah' sekejap lepas tu ok! Most of the bloggers were Chinese but I didn't feel awkward at all. They were so friendly and 'gila-gila' a bit.. So lets the pictures tell the story shall we? This is my absolutely favorite place. Look at the prizes! I was 'lalu-lalang' at this area so many times. Haha sounds creepy isn't it? But who doesn't love prizes?? Like hello?? Unfortunately I didn't win any of the lucky draws but its ok..
Me trying to 'posing-posing' with my DIY body scrubs. Miss Ayna played ukulele and sing beautifully. Told ya, the bloggers are no kidding! Our sweet miss Illy and Ciklilyputih having some pictures together..
Ohmaigad! I love my nails so much. If you able to reach this nail polish, try it. It is so beautiful. I was so 'sayang' to remove it. It feels like you have some mermaid-ish feeling to it. But hey, to remove it was such a pain. 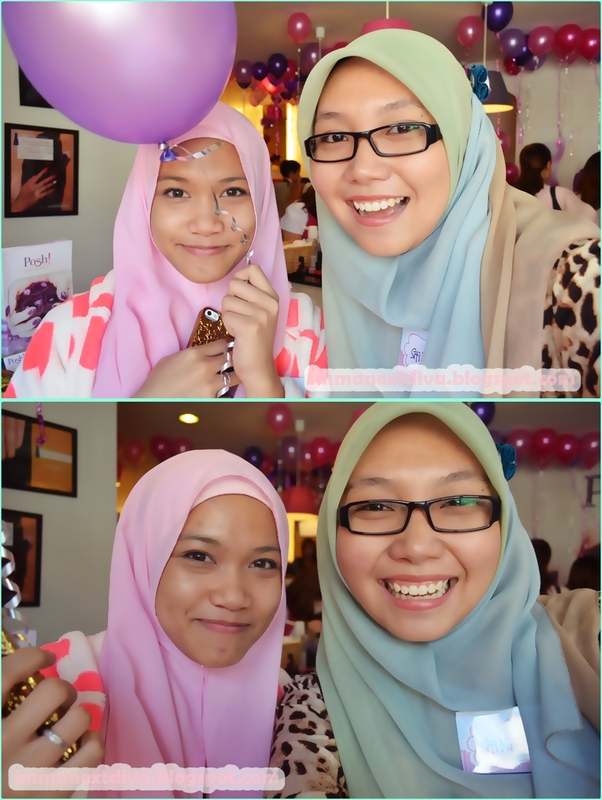 -.-"
I met Sabrina Tajudin for the first time. She was so sweet and super active! Haha. I'm pretty sure she managed to tried almost all of the treatments! We played with fotobox! It was super fun! I'm not sure you guys can see, but I was a cute wolf? Deer? I'm not sure. haha. So lets see what I got in the goodies bag.. Tara!!!!! I'm so happy.. I can not wait to try all of the products. I'm getting 'tamak' I want to used it all at one time. Not good Jaja. Not good! 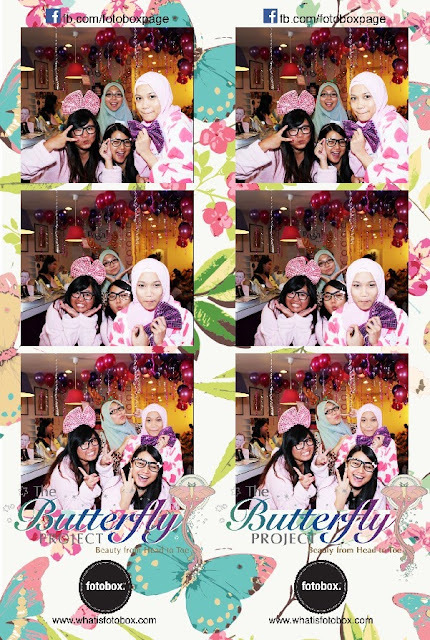 Before I end my entry, I would like to thanks to The Butterfly Project for invited me. I can't wait for the next event! And also to all of the sponsors that made this party happened! Check out the amazing sponsors! Nice meeting you on that day Izzati :) hopefully jumpa lagi next time yaa!